A three-year research partnership supported by the Mayor of London's Air Quality Fund is monitoring the effect of living green walls on air pollution. Middlesex University is the academic partner on a three-year research study into the effect of plants on improving air quality - the first project funded by the Mayor of London's Air Quality Fund. Working in partnership with Barking and Dagenham Council, the University's School of Science and Technology has built walls made of plants at Warren School, a secondary school in the borough, and will use these to study the efficiency of such 'green walls' at reducing harmful particles from the environment. The project was officially unveiled at an opening ceremony in July by Elizabeth Kangethe, Mayor of the London borough. Following a 2010 study commissioned by London Mayor Boris Johnson, it was estimated that more than 4,000 deaths per year in the capital are caused by the microscopic airborne particles emitted in exhaust fumes. Much has been made of the potential of green walls to help reduce these harmful pollutants as it is known that these particles stick to the leaves of plants, and the Middlesex green wall project will contribute to the body of data surrounding this theory. The first year of the study, which is being carried out by MSc Environmental Health student Alan Nichols and supervised by Senior Biosciences Lecturer Dr Dirk Wildeboer, will look specifically at the effectiveness of green walls in reducing two major road traffic pollutants: PM10 and NO2. Built alongside a busy road in the grounds of the school, the walls will be used to study whether their angle or height affects the number of particles captured by the plants. Five different plants have been chosen to compare their impact against one another, while a comparison will also be made against a naturally growing hedge to enable a cost benefit analysis. This is not the first green wall study to take place in London. Transport for London has commissioned a number of projects recently, including one carried out by Imperial College at Edgware Road Station that looked to identify the most efficient plants at reducing PM10, but there are still many questions to be answered. In addition to the environmental effects, green walls are also seen to offer social and aesthetical benefits by greening urban environments and generating a 'sense of place', as well as protecting and cooling buildings' façades and acting as a noise barrier. Other positive impacts include the provision of habitats for invertebrates and an increase of biodiversity in the built environment. On the other hand, the erection and maintenance of a green wall comes at a cost and there are those who think that these outweigh the benefits. "One of the objectives of our research is to be open-minded about it and generate more scientific data to see how good green walls are in mitigating air pollution and if they offer value for money," explains Dr Wildeboer. "We know that PM10 and NO2 particles stick to the leaves, but what happens afterwards? Some molecules might be absorbed by the plants and others get washed off when it rains and go into the soil. However, they could get washed off onto concrete and then when it dries potentially be re-suspended in the air." In 2013 London Mayor Boris Johnson announced the launch of an Air Quality Fund, which will provide £6 million of funding for three years to 2016, with the expectation that this will be extended to £20 million over the next decade. The fund will be used across London boroughs to support a range of green infrastructure projects aimed not only at improving air quality but also mitigating against climate change and reducing noise pollution. 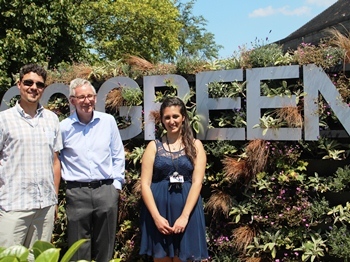 In Barking and Dagenham, this led Environmental Protection Officer Natalie Lusardi – a graduate of Middlesex University's BSc Environmental Health degree – to successfully bid for a grant to run the green wall project. She then approached Middlesex, who helped with the design of the green wall and the secondary school also got involved, with students designing the appearance of the walls by arranging the different plant species in geometric patterns. During the first phase of the study, leaf clippings will be collected every five weeks and brought to the laboratory where they are washed so the particles are suspended in water. This will then be drained through precise filters so only the particles remain and they can then be weighed to calculate the weight of particles captured per square cm of leaf. "We are monitoring the air quality using an automated system that we've put up near the green walls and will take continuous data of the level of air pollution so we can use it as a reference point," Dr Wildeboer says. "We also took background data for a month before the wall was erected so that we have that as a reference too." In early 2015, Alan's MSc study will be complete and the first phase of the project will come to an end. The School of Science and Technology will then involve other students in the project to collect more data and carry out research into different areas – such as the impact of the particles on the soil around the green wall.